As a highly respected member of Boston’s professional musical community, Ronald Knudsen was widely known as performer, conductor and educator. Throughout his extended career he devoted himself to bringing classical music of all kinds to the widest possible audience. Born in Nebraska and raised in Minnesota, Mr. Knudsen studied at the MacPhail School of Music in Minneapolis and Peabody Conservatory. Following Peabody he was a Tanglewood Music Center fellowship student, serving as both the orchestra’s concertmaster and soloist. 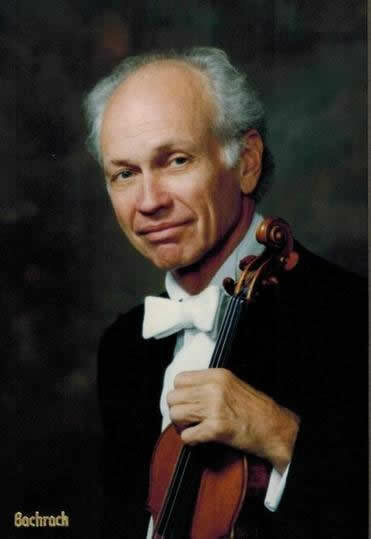 Mr. Knudsen retired after 48 seasons with the Boston Symphony violin section. Before coming to Boston in 1965, Mr. Knudsen was a member of the Baltimore and Detroit symphony orchestras. Since arriving in Boston, Mr. Knudsen was active in many aspects of Boston’s musical community. He was the original violinist in the contemporary music group Collage and in 1971 he helped to found the Curtisville Consortium, a chamber ensemble of BSO players and friends playing a series of chamber concerts each summer in the Berkshires. He was a violin soloist with the Boston Pops, Brockton Symphony, Newton Symphony and Worcester Orchestras and appears annually in chamber programs throughout Massachusetts. As a conductor, Maestro Knudsen conducted numerous orchestras throughout New England and in Japan. He served as Music Director of the Brockton and Newton Symphonies prior to being invited to be Music Director of the NPO. In June 1990, Maestro Knudsen made his conducting debut with the Boston Pops Orchestra, appearing as a regular guest conductor with both the Boston Pops and the Boston Pops Esplanade Orchestras. His appearances in December 1999 marked his 10th season as a Boston Pops guest conductor. In addition, he served as guest conductor for a variety of chamber and pops orchestras around the New England area. Maestro Knudsen has been acclaimed by the press, orchestra and audience for his programming, conducting skill and ability to bring professional standards to a non-professional orchestra. On a personal level, in addition to playing and conducting, Mr. Knudsen repaired fine old string instruments. In his “spare” time he worked on the restoration of his historical Victorian period home. Ron is survived by his spouse Adrienne Hartzell, two children and four grandchildren all living in the area. His son Sato is a member of the Boston Symphony cello section and his daughter Mayumi is a graphic designer. Ron was the recipient of a number of civic awards including Newton Pride Award for Excellence in the Arts and the 1997 Newton-Needham Chamber of Commerce Appreciation Award. Maestro Knudsen passed away on Sunday, March 29, 2015. There are many reasons to remember Ron, but we remember him most for his dedication to Music for All. Whether as audience members for a Classics, Pops, or Family Concert, as adult musicians looking for a home, or as student musicians or ballerinas performing side-by-side, Ron brought us together through music. Our best way to honor his memory is to continue to provide Music for All and to play because we love it; we hope you will join us. Memorial donations may be made to the New Phil Music Director Legacy Fund online or checks may be sent to PO Box 610384, Newton, MA 02461.